Xbox 360 Fanboy found this Flash document on Intellisponse's servers, which is an online research and web-survey platform. 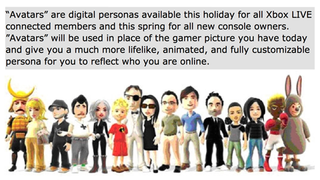 It shows off a picture of a bunch of Mii-like characters called Avatars, that (according to the text above it) are supposed to be for the Xbox 360 and are used instead of the gamer picture. It's unclear whether or not this picture is a survey, but seeing as Intellisponse is a survey and the picture looks a whole lot like a survey, it's probably a part of a survey.